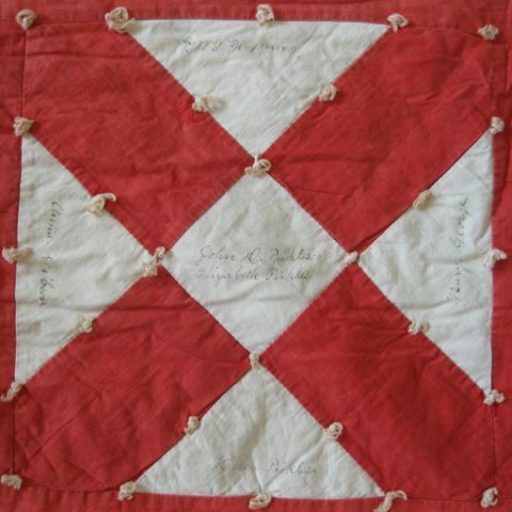 You can see the red and white inscribed quilt in Melrose, MA during December 2018. The Beebe Estate is the starting point, where you will find not only the quilt and its stories, but also art from today. In seven locations around Melrose, look for “Clues from a Victorian Quilt.” A banner and yarn decorations (aka Yarn Storm) mark interesting places tied to the quilt. Don’t forget to stop at the Melrose Public Library, where modern day quilts are on display. It’s homecoming for the Melrose History Quilt and Home for the Holidays. The inauguration of the Stitched Connections exhibit opens. Textile Conservator Ann Wasserman will be available to answer your questions about the Melrose History Quilt. First Fridays are all about art at the Beebe Estate. Join the artists of “Stitched Connections”, Ann Wasserman in this multi media celebration of history and art. Visit Stitched Connections, which features the red and white Victorian era quilt and contemporary fiber art exhibit. Follow the self-guided tour to discover more about Victorian Melrose. At 1pm, Ann Wasserman, the conservator who researched the quilt, will share her “Quilt Repair Tales.” Attendance, but please RSVP so you’ll have a chair. Ann will share stories from 30 years of repairing quilts. The family history stories embodied by the quilts and conservation guidelines influence her thought processes, guiding her choice of techniques. She will cover the why’s and how’s of restoration, conservation, rebuilding severely damaged quilts, and more. There will also be tales of why to decide to do nothing at all and love your quilt just the way it is. Attendance is free, but please RSVP so we can arrange for enough chairs. View the Stitched Connections exhibit and use the Beebe Estate to begin your journey into Victorian Melrose history, keeping your eyes out for the Yarnstorm, which highlights streets where the names found on the Melrose History quilt lived, as well as places registered on the National Register of Historic Places. It’s the last day to view the Stitched Connections exhibit. Begin your journey at the Beebe Estate, then travel to the other locations on the self-guided history tour. A “Yarnstorm“, will make those locations unmissable! The tour focuses on Victorian Melrose and the streets where the names found on the Melrose History quilt lived. You’ll also see locations on the National Register of Historic Places.